This revised and updated version of a classic introduction to deterministic chaos views the field from a physicist's point of view. This edition contains new sections on sensitive parameter dependence, fat fractals, characterization of attractors by scaling indices, the Farey tree, and the notion of global universality. 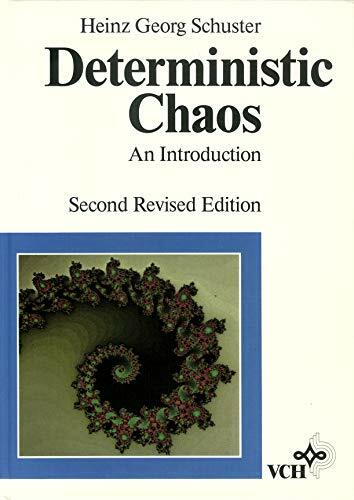 The book answers basic questions such as what is deterministic chaos, how is it generated, where does it occur, and what can one learn from a chaotic signal? It also explains advanced concepts such as bifurcations, intermittency, Liapunov exponents, functional renormalization groups, and strange attractors. The book requires no background beyond that possessed by a graduate student in physics. The book gives a self–contained introduction to the modern nonlinear dynamics physicist′s point of view. The basic concepts and methods of this theory, such as Lyapunov exponents, dimensions, Kolmogorov′s entropy, strange attractors, KAM–theory, Arnold diffusion, renormalization group theory, etc. are introduced and explained on an elementary level. Moreover, the general models of transition from order to chaos (period doubling, intermittency, Ruele–Takens model), chaos in quantum systems and the problems of controlling chaos are also discussed. The above material is explained and illustrated by a great number of concrete examples of chaotic dynamical systems arising in applications for which a detailed theoretical and numerical study is given.